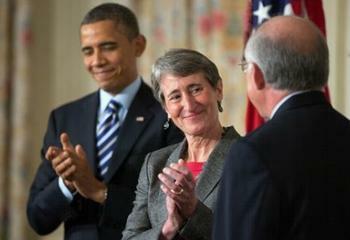 WASHINGTON, DC, February 6, 2013 (ENS) – Sally Jewell, who now heads outdoors retailer REI, the nation’s largest consumer cooperative, has been nominated as the next Secretary of the Interior. President Barack Obama named his choice to oversee 500 million acres of public land today at the White House, saying a fond farewell to current Interior Secretary Ken Salazar, who is going back to Colorado. “She is committed to building our nation-to-nation relationship with Indian Country,” said Obama. “She knows the link between conservation and good jobs. She knows that there’s no contradiction between being good stewards of the land and our economic progress; that in fact, those two things need to go hand in hand,” the President said. Obama joked about how little time Jewell might spend at her desk, knowing that she enjoys outdoor adventures, particularly climbing, snowboarding, kayaking. She has climbed Vinson Massif, the highest mountain in Antarctica. a month climbing mountains in Antarctica, which is just not something I’d think of doing,” Obama said. Now a Seattle resident, Jewell was born in England as Sally Roffey; she moved to the United States at the age of four when her father, an anesthesiologist, took a fellowship at the University of Washington. In 1978, the same university awarded her a degree in mechanical engineering. Jewell worked for Mobil oil company on oil fields in Oklahoma from 1978 through 1981, when she joined Rainier Bank, which was hiring engineers to help them understand how to go about making loans to oil companies. She worked in banking for 20 years, staying with Security Pacific, which acquired Rainier Bank, until 1992, and working for WestOne Bank from 1992 through 1995, and for Washington Mutual from 1995 through 2000. 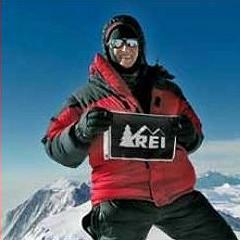 In 1996, she joined the board of REI and in 2000 was named chief operating officer, then CEO in 2005. Jewell has sat on the boards of Premera, the National Parks Conservation Association, and the University of Washington Board of Regents. She helped found the Mountains to Sound Greenway Trust. Jewell was named the Puget Sound Business Journal CEO of the Year in 2006. In 2009, Jewell received the National Audobon Society’s Rachel Carson Award for her leadership in and dedication to conservation.